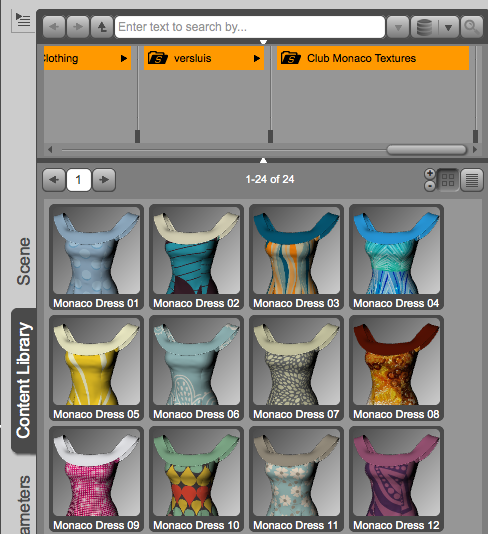 We’ve been hard at work on another texture set last week, and yesterday night it has been released: Club Monaco is now available – a set of 12 ravishing textures for the gorgeous G2F Shoulder Dress by kang1hyun (both available from Renderosity). 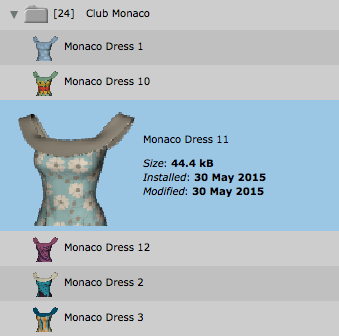 Club Monaco comes with 12 textures for the dress and 12 matching textures for the shoes. The promos were made with Jason and the Millennium Cat, and the decade old Townhouse by Ness Period Productions (all available from DAZ, and all rendered in DAZ Studio). The product comes as a ZIP archive. Simply unzip it into your main runtime / content library folder. On Windows this is slightly easier because files will be copied and merged into existing folders. On Mac, hold the OPTION key while dragging the unzipped folder over, otherwise OS X will replace existing folders rather than merge them. Note that in Poser, you can also use the integrated Content Installer: head over to the Content Tab, select Install from ZIP Archive and select the package you’ve downloaded from Renderosity. Select your desired runtime and all your files will magically end up in the right places. The G2F Shoulder Dress needs to be installed for this to work. To use our texture set, load a figure and fit the dress, fit the shoes, select the character again and apply the shoe pose for the high heels to be whipped into position. In DAZ Studio, head over to the Content Library and navigate to People – Genesis 2 Female – Clothing – versluis – Club Monaco Textures. Or use the handy search option. No Smart Content functionality – I have no idea how to distribute that. In Poser, head over to the Materials Tab in your Library Palette (the little painter’s palette icon next to the camera icon) and select Club Monaco. Or you can use the search option here too. Help! I can’t find my runtime folder! In DAZ Studio this is often called “My DAZ 3D Library”, found under Users – Shared. To find the exact location, head over to Preferences – Content Library – Content Directory Manager (at the bottom). Open DAZ Studio Formats using the little disclosure triangle and see your path. On Mac, open Applications – (your Poser version) – Runtime – prefs – Default Poser Prefs. It’s simple text file which will contain the location of your runtime. On Windows, the file is located in Program Files – Smith Micro – (your Poser version) – Runtime – prefs – Default Poser Prefs. If you have any further questions, please leave a comment below, or send me a PM on Renderosity. As always, render and enjoy!